Water temperature and the types of life it supports are some of the things scientists at the Flathead Lake Biological Station track to determine water quality in the Lake and its tributaries. The Bio Station has been monitoring water quality, and amassing information about the Flathead since its founding in 1899. The station is part of the University of Montana, but it’s funding is delegated by the state legislature as well as through other state, tribal, and federal grants. However, finding funding outside of the legislative allocation has been drying up. Research Scientist Tom Bansak with the Flathead Lake Biological Station says it costs about $150,000 each year to run the Bio Station. Bansak says the state legislature allocates $100,000 to the Station. 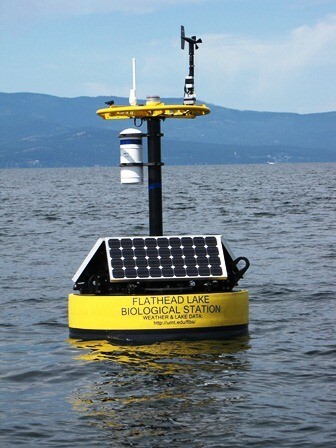 In August 2011 the Flathead Lake Biological Station set up two hi-tech buoys along the lakes deep trench. The buoys transmit weather and water quality information to the Bio Station. The information is available to the public, updated every 15 minutes, through the FLBS website. “And so for the last few years, the Bio Station itself has been making up the shortfall to keep our long term monitoring program going, and there’s a tremendous amount of value of having a long term record of conditions on a water body like Flathead Lake,” Bansak said they started using a more “scientifically rigorous” monitoring protocol in the 1970’s with a proposal to mine in the Canadian North Fork Flathead River basin. Water quality information available to the public through the FLBS website. “Tracking the trends of increases and decreases of those different things gives us a good indication of what’s happening in the lake; whether water quality is staying stable, increasing or decreasing,” Bansak said. Bansak says paying people is the biggest budget item. Next are the tests they run on the water samples, facilities costs, fuel for the boats and maintenance for all the vehicles and equipment. About a year and a half ago the station received a $1-million pledge from a donor wishing to remain anonymous. The Bio Station has until the end of 2014 to match the pledge dollar-for-dollar, and Bansak said they’re at over $250,000 now. Bansak is also the Development Coordinator for the Flathead Lake Monitoring Challenge grant. As part of public outreach and fundraising the Tamarack Brewery of Lakeside is hosting a Community Tap Night with 75-cents of every pint sold to benefit the Biological Station Wednesday the 15th from 6 to 9PM. 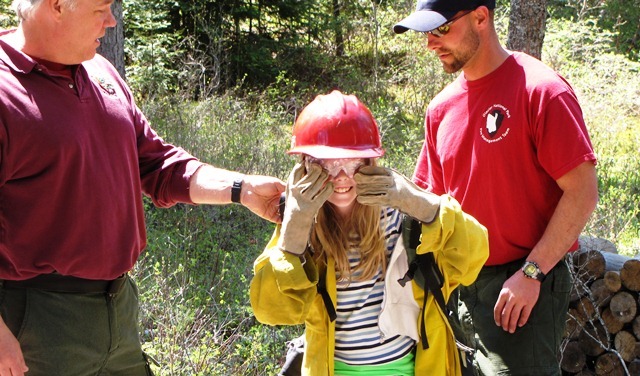 A student helps firefighters demonstrate the equipment they carry as part of the Forestry Expo. -Katrin Frye photo. All this week fifth graders from the Flathead Valley and beyond have been heading to a section of woods in Columbia Falls. It’s the Forestry Expo, and this Saturday it opens to the public. This is the Expo’s 24th year. It takes place in the Trumbull Creek Experimental Forest on F-H Stoltze land near Columbia Falls. District Ranger Deb Mucklow says it includes land managers like the forest service, department of natural resources and conservation, fish wildlife and parks, as well as organizations like the Audubon Society, to Back Country horsemen and the native plant society. “It’s not one agenda against another agenda, it’s a common goal of education, and having good information for people to be informed and educated about the special places and the forest that surrounds the places that we live and work in,” Mucklow said they see nearly 1,400-students through the week, and more than 500 people generally show up for the family day on Saturday. Swan River School 5th Grader True Gannon checks out the different animal pelts at the wildlife educational station at the 24th annual Family Forestry Expo near Columbia Falls. – Katrin Frye photo. “Just sharing this common message about noxious weeds, what fire management is, and while reaching 5th graders is really good, reaching some of the parents and others in the valley, giving them an opportunity and an environment that was a comfortable environment, so that there was no dumb questions, so that they could watch and learn, and have it be one-on-one,” Mucklow said. The Forestry Expo runs from 9 to 3 on Saturday with grandstand presentations from the Flathead Valley Community College Logger sports team as well as many different informational stations covering fisheries, forest management, and wildlife, and more. The Lifeline phone discount is a service offered by telephone companies to help low income and fixed income Montanans afford telephones. People on Medicaid automatically were eligible for the program, but recent changes have expanded the number of people eligible. Director of Regulatory and Legislative Affairs for Montana Jeff Hubbard said with the changes now the phone company is verifying if customers qualify instead of the state. “Before the state only had Medicaid, and now the federal has come along and said all these other programs qualify. The state did not go for a legislative change to their rules to adopt the FCC rules, so the state is Medicaid only, and the federal rules for additional credits are a lot of the additional programs,” Hubbard said. The federal Lifeline program allows for a discount on phone service for people below 1-hundred-35-percent of the federal poverty level; which is just under 13-hundred-dollars a month for a single person. The office of Public Assistance helps guide people through different state and federal aid programs. Megan Wilkie with the Lewis and Clark County office works with a little less than 500 clients in the Helena area and said many of them are living on fixed incomes of less than 9-hundred-dollars-per month. She said her office started getting calls in December of people whose phone bills had jumped from $6 to $36 each month. “Which I think for someone with a regular income would not be a big amount, but the percentage of their income, and the amount it had increased; people who are living on a very fixed income where every dollar matters were really rocked by that,” Wilkie said. “I want to know what people are actually required to show because some of the things that I’ve heard that they’re asking for are, like I said, don’t exist, or seem invasive,” Wilkie said. Online through the CenturyLink website the Montana Application for the Lifeline Discount has you check boxes for different federal programs including Medicaid, housing and food assistance. It asks applicants to attach a copy of the eligibility documentation for any of the participating programs. Hubbard said CenturyLink sent out a letter to participating customers last year to let them know they had to re-certify through the phone company to keep the discount in 2013. In a Press Release from earlier this year the Montana Public Service Commission said 6,858 people of the 13,184 Montanans who had been receiving the Lifeline discounts lost it with the changes. The release stated the vast majority of customers who lost the discount had not responded to the phone companies when they sent out the notice about the changes. The release said of the 6,363 customers who did respond, only 37 were deemed no longer eligible. 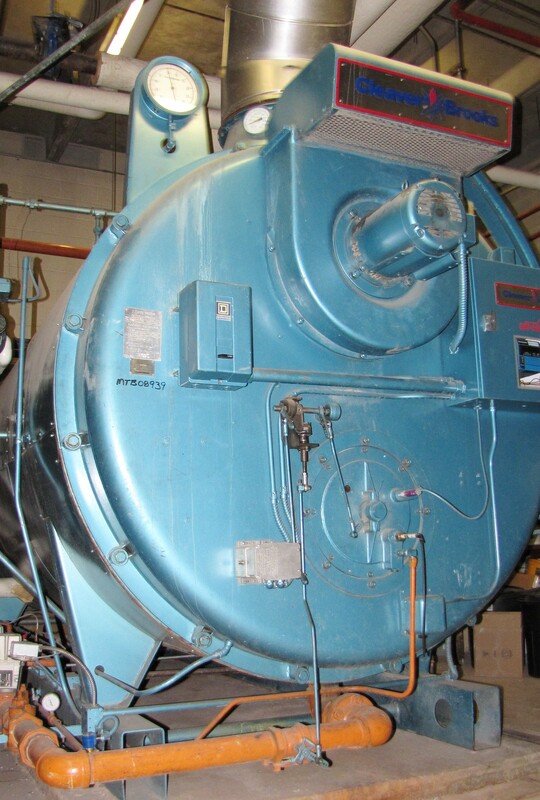 Flathead High School’s steam boiler, installed in 1986 will be supplemented by hot water heat in an effort to increase efficiency and effectiveness. One of Kalispell’s oldest schools has been looking for a way to pay for upgrades to its heating and cooling system that will also increase its energy efficiency. Voters have rejected three different building reserve fund requests in the past three years. The building reserve funds pay for maintenance of district buildings, and for technology updates and upgrades. Superintendent Darlene Shottle said with voters rejecting the schools request for these funds three times in three years, it was time to find another way. “So we felt that the community was saying, ‘we can’t afford this right now,’ and we need to look at more innovative ways to try to do some of the building upgrades that needed to be done,” Shottle said Flathead High School is of particular concern with classroom’s either too warm, too cold, or water was leaking in through the roof. The district hired Ameresco to conduct an energy audit, and implement the energy efficiency fixes. Some of those fixes include installing a hot water heat system to supplement the steam boiler system currently heating the building. Upgrading lights to lower wattage bulbs, and familiar weatherization efforts like sealing cracks around doors, windows, and insulating are other changes planned. Shottle said they’re looking at more than $3-million in improvements across the district, with more than $2-million just for Flathead High School. The school district will receive a $1.2-million “Quality School Grant” from the state to address the Flathead High energy upgrades, and is taking out a loan for the total upgrade costs. “We’re estimating that about $130,000 per year will be paid back through energy savings, and so we will pay back between the difference of the quality school grant and the amount of money we need to do the upgrades through the energy savings,” Shottle said another option they’re looking at is QZAB bonds. She said they’re zero interest federal loans specifically for maintenance and upgrades of school buildings. The North Fork of the Flathead River borders Glacier National Park’s western edge. – Katrin Frye file photo. What started as a master’s thesis continued beyond her degree and research scientist Erin Sexton has seen her teams work hit headlines and effect policy on both sides of the US-Canadian border. Sexton works with the Flathead Lake Biological Station and has been focusing on the water quality of the Flathead River Basin, specifically the North Fork of the Flathead. She was recently recognized with the Montana Chapter of the American Fisheries Societies Conservation Achievement Award for 2012. The North Fork of the Flathead River has its headwaters in British Columbia flow from mountains rich in coal, gold and coalbed methane. The North Fork is designated a “wild and scenic river” and threatened Bull Trout live in its waters with their spawning grounds also near the headwaters across the border. Sexton said while working on her master’s thesis in 2002 there was discussion of coalbed methane development for the section of British Columbia near the headwaters of the North Fork of the Flathead River. Her thesis looked at the type of changes that would be seen in a watershed draining off of open pit coal mines. She and other researchers from the biological station, Montana Fish, Wildlife and Parks, and the U-S Fish and Wildlife Service gathered baseline information on the Flathead River. “So, for example, you look at the full suite of metals. You look at Cadmium, Barium, Copper, Selenium. These metals and elements basically leach off of open pit coal mining, so we wanted to see what the signature was of these in the watershed in a pre-mining condition,” Sexton said what they found in the North Fork was a relatively pristine system with low nitrate and sulfate levels. Sexton said what you see in the rivers downstream from a mine is the underlying geology coming to the surface with higher readings for nitrates and sulfates. In the process of collecting data on the North Fork they looked to compare it to a river that had seen open pit coal mining upstream. They used the nearby Elk River in Canada which runs into Lake Kookanusa and the Kootenai River system. 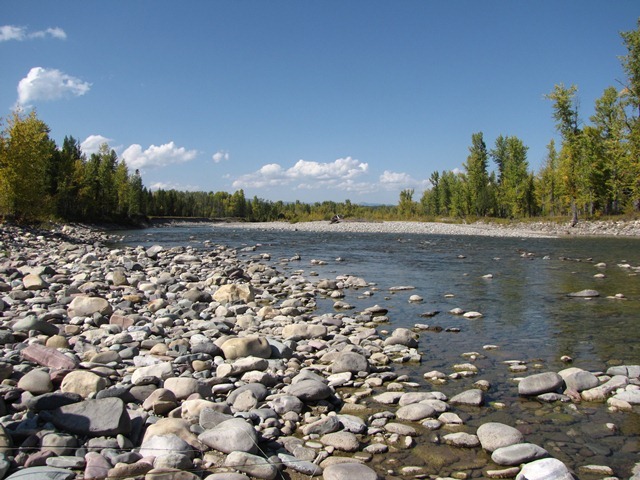 The Elk River recently made headlines after being identified as one of the most endangered rivers in British Columbia. Sexton said they measured 10 times the amount of Selenium in the Elk as the Flathead, 50 times the sulfates, and 1,000 times the nitrates. “We’re particularly concerned about nitrates and phosphates and sulfates in the Flathead watershed. If you have too many nitrates in a system you’ll get a ‘greening up’ of your watershed because it feeds the algae in the system,” Sexton said. The research continues. Sexton said moving forward she anticipates an increasing focus on the Elk River and the Kootenai system as legislation on both sides puts many mining questions for the Flathead to rest. However, she said questions about best management practices for cross-boundary natural resources will continue to evolve. 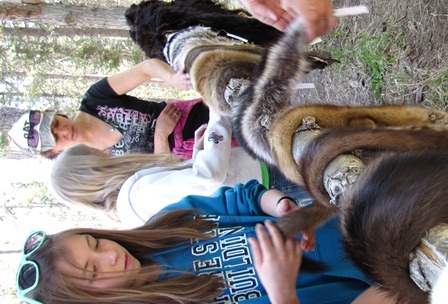 This Saturday, April 27th the 4th annual Global Youth Service Day caps off Earth Week events at Flathead Valley Community College. The community garden behind Flathead Valley Community College needs some work. Quackgrass is invading the raised beds, and last years beds of squash, greens, herbs and more need weeding. 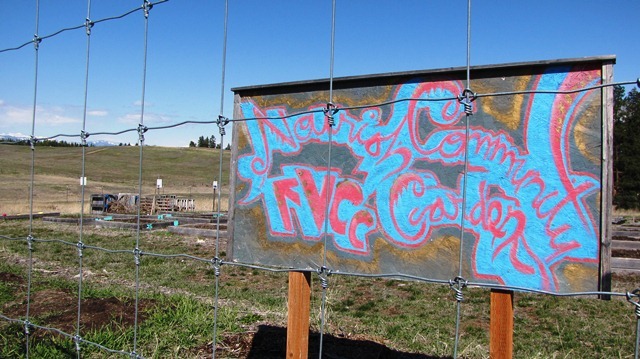 This Saturday April 27th people renting the raised beds in the Farm Hands Nourish the Flathead Community Garden behind FVCC will be working alongside about 80 youth from across the Flathead to get the beds back in shape for Global Youth Service Day. “Really we’re going to wake up the garden and get it ready for the next planting season. And part of that will be weeding beds, and planting, you know- just the normal things you do to get your garden ready for the summer planting,” Gretchen Boyer is on the board for Farm Hands. She said this is the fourth year of the community garden, and of observing Global Youth Service Day. Boyer said the students are coming from area high schools, the Montana Academy, the Center for Restorative Youth Justice, and a Girl Scout troupe is also participating. restaurants that serve their food, the farmers markets where you can buy from them, and the community gardens where you could grow your own. It runs the community garden in partnership with FVCC, renting out the 40 raised beds to community members. Besides renting out the beds it also offers programs for youth across the Flathead. Boyer says the underlying goal of Farm Hands Nourish the Flathead is connecting people to the sources of their food. Farm Hands Nourish the Flathead runs the community garden in partnership with FVCC on the college campus. 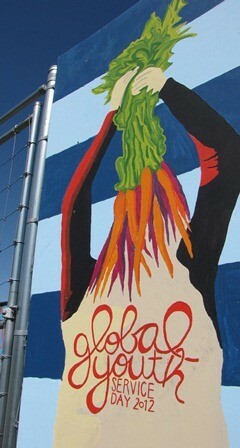 “We also believe, as Farm Hands, Nourish the Flathead, that the community aspect of farming is important. So, the community garden really lends itself to having people garden together and asking for advice on issues that happen within plots, and learning about what grows well, but doing it with lots of other folks is pretty special,” Boyer said. Farm Hands Nourish the Flathead hosts Global Youth Service Day in partnership with Montana Conservation Corps, FVCC, The Center for Restorative Youth Justice, Montana Academy, Flathead Youth Home and other local youth organizations. community garden behind the Arts & Technology Building on the FVCC campus, rain or shine.